Old Town Library has now re-opened to the public following the refurbishment. 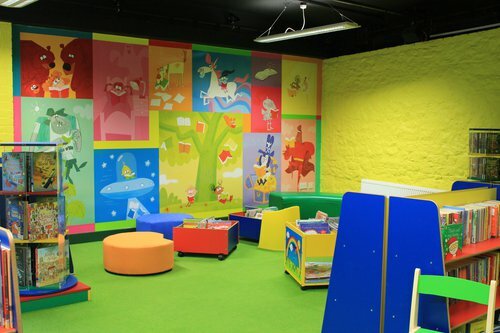 The library now contains a room which is entirely focused at young children and includes 2 mural designed by children's book illustrator Fred Blunt. The photographs below give you a flavour of the new space, but please come along with your children to take a look. The library will still contain an adult section and it will still be possible to order books, as before. There is still some more work to do. A new carpet is to be fitted in the adult section and new computers are waiting to be installed. This should all be completed early in the new year. The Parish Council held a short re-opening ceremony on Saturday 9 December 2017 where Cllr Janine Howarth, Vice-Chair of the Parish Council officiated and was helped by Fred Blunt to perform the opening.